The Rock Creek barn was built in 1865 of locally sourced hardwood timbers, due to a lack of railroad accessibility during this period. The material consisted of white oak, red oak, walnut, hard maple, and hickory native to the Sangamon River Valley. Around 1844, the land was purchased by James Stephenson (born in 1782 in South Carolina), and around 1854, the land was taken over by Mr. Stephenson’s daughter, Elvira (Stephenson), and her husband, Aaron Runyon Houghton. This barn was of particular interest due to its construction for multiple uses. The barn was a bank barn (meaning built into the side of a hill), with basement access from both sides for livestock to seek shelter. Also in the basement was a limestone foundation dating back to pre-civil war. In addition to shelter the livestock also were fed in the basement. Their hay and grain came from wood chutes built into the structure above. The first floor was accessible from the north and south ends of the structure via hillside and was originally designed for wagons to be pulled through the structure, where they would dump their grain and feed it into the grain bins located on the first floor and then shoved down into the troughs below. On the third floor was the grain elevator and the hayloft with chutes designed to drop square bales from the second floor to the basement into special designed feeders. This construction coupled with the silo next to it allowed the farmers to run a majority of their livestock operation from a single barn. The exterior cladding on the barn was done in 1x5” tongue and groove siding with an intricate groove down the center, which showed the time, craftsmanship and attention to detail the builders put forth. 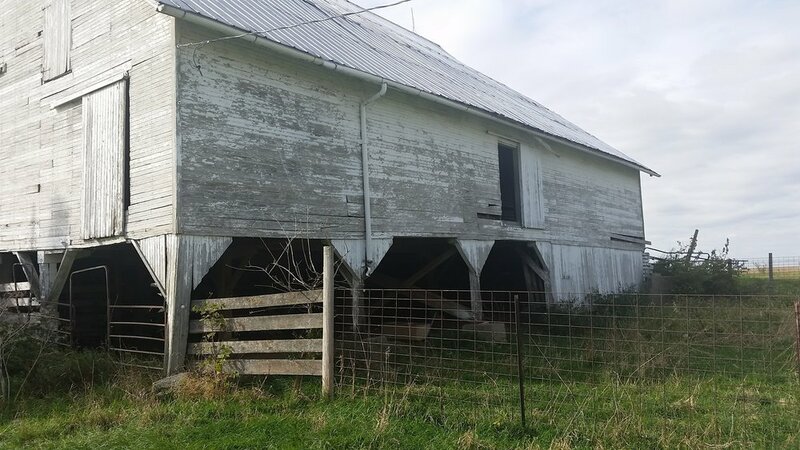 When the Rock Creek Barn was dismantled in 2016, it was still in very good condition but the Johnson family hated to see it deteriorate any further as there was no livestock on the property.